The Local Weekly and Elphinstone Logging Focus (ELF) have partnered for an exciting photo contest. With our unique hiking trails, you or your family have a chance to win by submitting your photo of the with a unique forest ecosystem with parts of the original forest still available to access. ELF is part of a growing movement across the Province to cherish unique stands of these older forests, along with hikers who like to roam these forests looking for rare and interesting trees. This is called ‘Tree Searching’. In that spirit, ELF is hosting a photo contest to look for the ‘gnarliest’ tree possible as an example of the diversity of natural forms. Types of gnarly trees can include strange or surreal bark patterns, multiple trunks or woven branch structures, blown over root bases, damaged sections that have re-grown creating imaginative faces, etc. 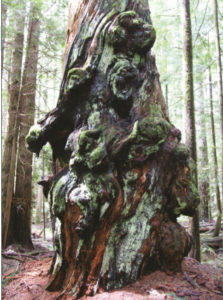 ELF has found an example of one gnarly tree shown here in an undisclosed location in the proposed Elphinstone Park expansion area. It will not be part of the submission, however in late September we will be announcing a public walk to see this incredible example. Send your submission to the Local editor (editor@thelocalweekly. ca) up until August 31. The judge of the ‘Coast’s Gnarliest Tree’ will be local sculptor Rob Studer who brings a trained eye for shape and form to the contest. First prize is a cash amount of $250, second prize: a guided walk for 2 by ELF to the Roberts Creek Ancient Headwaters (lunch provided), third prize: a 2017-18 ELF supporter package: ELF T-Shirt, Health Trail map, and Dakota Bear Sanctuary poster. The winning tree photos and photographers will be announced and featured in the The Local Weekly.